In an earlier post, I’d written about the current administration’s efforts to reverse Obama-era energy policies by reducing the social cost of carbon towards its lower end. A new series from Columbia University’s Center on Global Energy Policy (CEGP) has an interesting take on the metric, which is increasingly becoming a standard for measuring climate policy in states and at the federal level. Briefly, the first post in the series posits that there are several inadequacies to the social cost of carbon in its current form. It discusses the utility and role of the social cost of carbon as a tool for measuring and implementing climate policy and raises several important concerns. A possible change in calculations for the social cost of carbon could have important consequences for utilities. The social cost of carbon, which aims to put a monetary value to the costs of emitting carbon dioxide in the atmosphere, was first devised in the 1990s. The Interagency Working Group established by President George W. Bush Jr. came up with the range of values used to represent it today. The single value used belies the complexity and variety of aggregates used to calculate it. For example, global macroeconomic future projections are one of the factors used in its calculations. As are climate models that project effect of temperature and other climate impacts into the future. The metric also uses “damage functions” that quantify the impact of carbon emissions in monetary terms and attempts to aggregate harmful policies and actions over the centuries into a number. The multiplicity of inputs used to calculate the metric has two consequences. First, it ensures that the metric has a broad range. In the US, it has ranged all the way from $15 to $150 per metric ton of CO2. Values for the social cost of carbon have been revised from $57.80 per ton to $74.80 per ton by 2050. The divergence in the values for social cost of carbon can also be used as an approximation for climate policy: a high social cost of carbon indicates a strong commitment to climate change and a low value could translate to a relatively weaker commitment. (But a recent Regulatory Impact Analysis (RIA) found that the benefits of having a social cost of carbon outweighed the drawbacks of having a broad range of values). Second, the complexity of its calculations means that the final, simplified value is increasingly being used as an “off-the-shelf” metric to establish policy measures. Noah Kaufman, author of the post points out several problems with the social cost of carbon in its current form. The first one is the limitation of data and modeling techniques used in this form. For example, it is not possible to calculate completely the overall effects of climate change phenomenon, say the rise in sea levels, given a constantly changing natural ecosystem. The paper’s author also argues that the US social cost of carbon was calculated using values for damage to the environment based on emissions. It did not take into account the costs of generating power from various sources. The projected models used in a modeling of the social cost of carbon also do not take into account the entire spectrum of human activities that may affect final outcome. The second one are the omitted impacts from the model. Ocean acidification, which could have negative consequences to human existence but is impossible to quantify monetary terms, is one. The third problem is the arbitrary value system used to determine the final number. The post provides three values - the benefits of avoiding damages in future generations, the benefits of avoiding large risks, and the benefits of avoiding damages to the most vulnerable - as examples that could be susceptible to variances due to assessments by individual value systems. Indeed, the broad range of estimates presents an opportunity for regulatory agencies to use the social cost of carbon to further their value systems by translating them into policy. The current administration’s selection of a low value for the metric is an example of value systems at work. A New York county Supreme Court will hear a case regarding the New York Public Service Commission’s efforts to calculate subsidies for nuclear energy in 2018. In a testimony to the Subcommittees on Energy and on Oversight, Ted Gayer, senior fellow at the Brookings Institution, pointed out another problem with the social cost of carbon. According to him, calculations for the social cost of carbon take into account the effect of carbon emissions on a global scale. He estimates that the difference between global and domestic benefits is 4 to 14 time greater than the estimated domestic measure. “For example, for its proposed regulations for existing power plants, the EPA estimates climate benefits amounting to $30 billion in 2030. However, the estimated domestic climate benefits only amount to $2-$7 billion, which is less than EPA’s estimates compliance costs for the rule of $7.3 billion,” he stated. In effect, the cost of regulations for American utilities outweighs the benefits its citizens receive from reduced pollution. What Does The Social Cost Of Carbon Mean For Utilities? Measures are already underway in various states to utilize the social cost of carbon in energy policies. For example, Minnesota, Colorado, Maine, and Nevada use the social cost of carbon to evaluate proposals for new power plants. The New York Public Service Commission has incorporated it in its clean energy standard. The Colorado Public Service Commission plans to charge $43 per ton of CO2 emitted, starting in 2022. That charge is expected to go up to $69 per ton by 2050. But these initiatives could face an uphill battle, if a court case in New York challenging the PUC’s subsidies to nuclear energy based on its Clean Energy Standards goes in favor of the plaintiffs. With fracking about to recommence in the UK after 8 years, social entrepreneur and writer Jeremy Leggett reviews the short but troubled history of fracking in the U.S. The USA faces an uncertain energy future. Where should the country’s energy leaders turn? 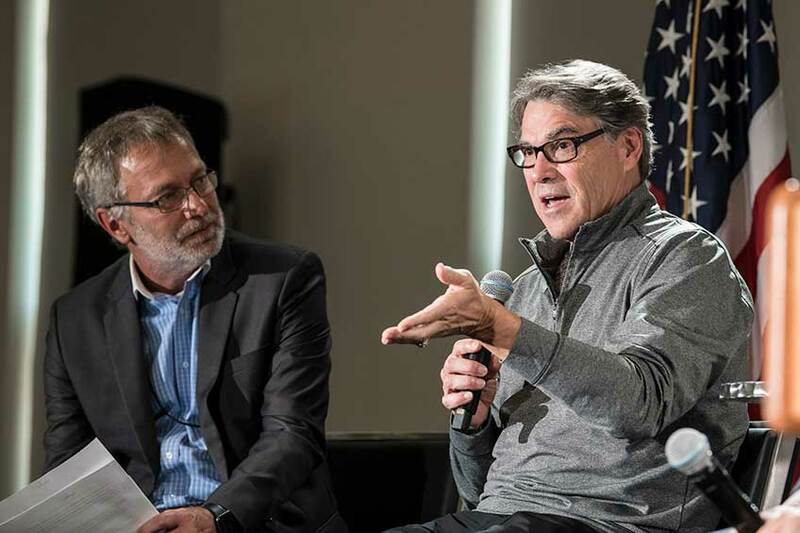 "I'm a big supporter of public-private partnerships," stated U.S. Department of Energy Secretary Rick Perry. Organizations, like the National Renewable..
Nine states, including California and New York, released a plan yesterday to boost the number of electric vehicles on their roads by 2021. Together these nine states comprise 30% of all car sales in the US. The plan has 80 recommendations for a..
First Solar Announces New U.S. Manufacturing Plant | First Solar, Inc.
Is it the Trump effect? I don't know. But solar companies seem to be in a rush to bolster to their domestic manufacturing creds after tariffs were instituted for imported solar panels. First Solar's announcement follows acquisition of SolarWorld..